We offer quilting classes for all levels. Drop by the store to see what we have in the works, or to request a specific class to suit your needs. We have a separate classroom with plenty of table space and a design wall. If you don’t have any of the above tools, you can purchase them at the store and get a 10% discount. Open Sew: Every Sunday, 5 – 9 p.m.
Bring your projects and ideas to NJQ’s Open Sew every Sunday from 5pm – 9pm for a friendly, informative, and fun night of not just quilts. Space is limited and we ask you to call and let us know if you are planning on joining in: (510) 797-6579. Join Willy and friends for a Sunday get-together. 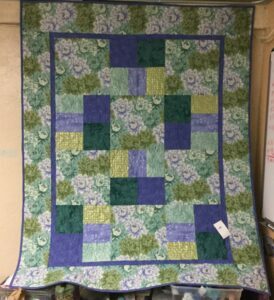 Starting in January 2019, drop in beginning quilting classes will be held every Saturday 10:30 am until 3:30 pm. Take a class or drop in for help on your project. Drop in class fee is $40 for the day. We can schedule classes other days more convenient to you. Call Nancy in advance to reserve a sewing place at 510-797-6579. Space is limited to 6 students. Let us know if there is a specific pattern or technique that you would like to learn. Learn to quilt by making this Just Can’t Cut It quilt, designed by All Washed Up. We will make the child size quilt which finishes at 51″ x 63″. You will learn to cut fabric pieces and resew them into a block. You will learn how to position your blocks so that the overall look is pleasing to you, and then how to sew them together into a quilt top. You will learn about different battings, backings, and quilting technics. When your quilt sandwich has been quilted, you will learn how to trim it and finish your quilt with binding. This is a quick and versatile pattern that is perfect for our aboriginal fabrics. 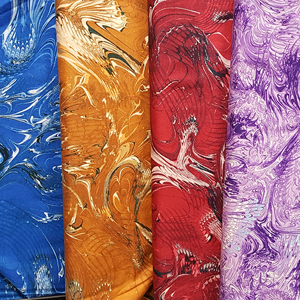 Choose our fabrics or novelty scenes, vintage or contemporary prints, or warm flannels. All you need is a focus fabric and 5 coordinating fabrics. You will get the fabric yardage requirements when you register for the class. SCHEDULE: Saturday 10:30 – 3:30 at your convenience. Call (510) 797-6579 to register. FEE: $110 for 4 weeks of instruction, pattern included. 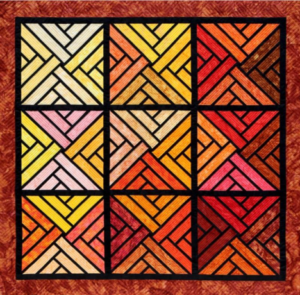 Join Victoria Johnson, a Judy Neimeyer certified instructor, to learn Judy’s paper piecing techniques on any of her patterns. The patterns are simple enough for new quilters and still challenging for experienced sewists. The Fractured Paint Box pattern, table runners and small quilts are available for beginners while more complicated patterns can be interesting for the advanced quilter. To sign up, or for more information, call Nancy at the store, (510) 797-6579. A fee of $40 is paid to the instructor per class. Classes will meet the first Sunday of the month at 10 am. Mark your calendars. NJQ recommends the Judy Neimeyer’s Paintbox pattern as a good beginner project.